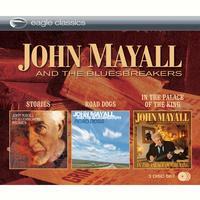 This three CD set is a great value and allows fans to get three killer John Mayall albums in one place. John Mayall is arguably the king of British blues and he’s always produced great music. These three discs each have their own flavor, but yet provide a consistent Mayall vibe. Stories was Mayall’s 2002 release. Amazingly it was his 52nd album. It’s a well rounded slab of Mayall blues rock. Road Dogs came out in 2005 and it was another strong set. I reviewed that one separately and for the sake of consistency the individual track reviews here were taken or modified from that review. In the Palace of the King was released in 2007 and a lot if has a very retro sound. The “King” referenced in the title, and the one to whom the album is essentially a tribute, is Freddie King. The thing is, so much of the album sounds like BB King to me that I actually looked to see if he might be guesting on the set. Still, I have to admit I’ve not heard Freddie King, so it might sound like him, too. Either way, it’s a different flavor from the other two sets, but also another great album. A slower, mellower blues number, this has a bit of a Robert Johnson vibe to it. The sound is more modern than that, though. Plus, it gets worked out into a more full arrangement that rocks out pretty well. Still, that early section has a lot of that backporch blues style to it. Even when it gets brought up, it retains a bit of that, too. There is also a bit of a Canned Heat vibe here. This gets pretty involved and has some intriguing musical moments that even wander toward progressive rock at times. The rhythm section starts this one off and they move out with a real Bo Diddley beat. Female backing vocals on this cut lend a soulful air. The whole thing has a real meaty blues rock feeling to it. A down-home blues guitar solo adds a lot of charm. This thing is a real screaming rocker. It’s still a blues tune, though. It’s a bit along the lines of the kind of thing Stevie Ray Vaughn used to do. Of course, I think all that ties back to the first electric blues from Muddy Waters and John Mayall was probably at one of the shows on that British tour that changed the music in England forever. This is one of the highlights of this particular disc. Soul, jazz and Latin music are bolted to the structure that is John Mayall music here. Parts of this definitely make me think of Santana a bit. It’s a great bit of variety and a smoking hot jam, too. I love the retro organ sound and the piano fills on this. This one, appropriately, is based more on old time blues. Still, it’s got modern treatments. The slide guitar really stands out, though. Soul, jazz and the blues combine on this cool jam. It reminds me a bit of Traffic in some ways, but gone more real blues style. The piano solo on this is great. Here we get one of the more traditional blues numbers. The organ adds a lot to this arrangement. The duet between organ and piano that serves as the extended outro is magic. Energetic and funky, this is a fun tune with a cool soulful groove. High energy rocking blues is the order of business here. This is very classy stuff and a real rocking tune. It’s got a bit of a soulful element and some great organ and guitar work. The piano that starts things here makes me think of Jelly Roll Morton. The whole cut works out from that basis into a retro sounding jam that’s got lots of jazz in the mix. That piano gets a solo later in the tune. A Stevie Ray Vaughn like guitar starts this song. As it kicks into gear that sort of sound is very prominent. Add in some Buddy Guy and you’ll have a great idea of what this mid-tempo blues rocker sounds like. The mid-section jam is more traditional blues. Another energized blues rocker, this is good stuff, too. Lyrically, this seems to be a nod to the whole “Crossroads” thing. The guitar soloing on this is stellar and the whole piece is just full of style and charm. Proving that he still dishes up this brand of blues rock as well as any, Mayall and the band jump in with this mid tempo grind. It features a couple tasty, but not flashy guitar solos and a pretty killer extended instrumental outro. This is a slow and gritty, more traditional blues with a very BB King type of texture. It features an awesome duel between the keys and the guitar. A blues stomp closer to ZZ Top's brand (but Mayall was doing this way before that little ol' band from Tejas), this one feels a bit like BB King and Buddy Guy, too. The guitar solo on this one just sings, dances and screams in a very extended jam. This one reaches back even further for a back porch, harmonica laden acoustic blues performance. Another slower old school blues, violin overtop adds a bit of a country feel to this one. It doesn't do much for me. Staying in the traditional blues range, this is a jazzy romp that could have come out of the 1940's. It's quite cool. It features some killer harmonica work. This has a more modern hard-edged soulful approach, and it really rocks. This is a fun mellow bluesy rocker. This hard rocking blues jam is a real smoker. It has some killer keyboard and guitar soloing. In fact, this I one of the best cuts on the Road Dogs disc, and has some of the most awesome guitar work on show here. With a more straightforward rock and roll texture, this one is still steeped in the blues. This is another standout track, and a real stomper. It also has some even more stellar guitar work. That fact is even more incredible when you consider that the lead guitar on this track is handled by guest musician Eric Steckel. 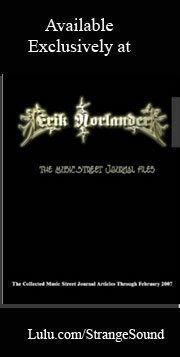 Now, Steckel, who has his own band, was 14 years old at the time of this recording! This kid can put lots of guitarists out there to shame. I'd never heard of him before, but he's one to check out. He's got a bright future ahead of him. This is another down-home blues cut. It has a fast paced jazzy groove, but also some country like textures. That violin returns to bring the country flair back. Gritty hard-edged blues rocking is on the bill once again. and this grind is another killer. In fact, it's my favorite track on the Road Dogs disc. This quotes some killer classics, too - all of which are mentioned in the lyrics. A retro sound permeates this one. It feels a bit like Buddy Guy or BB King. The keys rule this one, delivering a couple powerful solos. The sole instrumental on this second disc, this one is a bouncy sort of jam that's fun and feels very retro. This is another straightforward blues rocker. It isn't the strongest track on the Roed Dogs CD, but definitely is solid enough to make for a strong album closer. This is an old school energized blues meets jazz jam. It’s a lot of fun and includes a horn section. I’m reminded of BB King quite a bit here. I’ve always loved every version of this song I’ve heard. This is a scorching hot guitar blues based rendition. It’s among the best performances I’ve been honored to experience of this one. It has some scorching guitar soloing in it. Older blues sounds are the order of business here. This is another that makes me think of BB King quite a bit. There’s a lot of jazz and energetic rock and roll on this killer tune. The horn section adds a lot and the piece just reminds me a lot of Buddy Guy. Another that has a real retro blues sound, this also has some tasty guitar soloing. Featuring a horn section, this one also has a very vintage sound. The King of blues is a valid reference point here, too. That’s particularly true of the guitar solo section. The jazzy groove late in the track is great. They bring some funk to the table here. This is retro, but more like soul than pure blues. It’s a killer tune. In fact, it’s one of my favorites on this set. Jazz, blues and more meet up on this number. Somehow it makes me think of Robert Cray. It’s a smoking hot tune with some great guitar sounds and some cool changes. Old school blues, this is bouncy and fun. The arrangement is more of a jazz treatment. A slow blues number, this is awesome. It’s a highlight of the whole set. It makes me think of “The Thrill is Gone” quite a bit. And, as I mentioned before, that’s a good thing. There are some horns in the mix here and this thing just oozes cool. There is some killer saxophone soloing on this. This instrumental is a real screamer. It’s got both a smoking hot harmonica solo and a killer guitar solo. Here’s another that sounds so much like BB King that it’s scary. I love this tune, too. There’s a real boogie woogie kind of feel to this retro sounding number. The piano plays a prominent role here. Another energized blues rocker, this has some great retro textures.